In addition, they said, those responsible for “one of the most grotesque public expressions of police brutality, intimidation and mass violation of civil liberties” need to be held to account. Mark Calzavara, of the Council of Canadians, said police detained more than 1,000 people after a some protesters broke windows and burned a few police cruisers. “When the police are the ones that are breaking the law, that’s when all of society has to really start to pay attention,” Calzavara said. While the vast majority of those detained were released without charge within 24 hours, about 250 people still face charges and more than a dozen remained in custody Monday, according to the Movement Defence Committee. The groups called for the release of those still incarcerated, saying the mass arrests amounted to criminalizing dissent. “These are political prisoners and they are being attacked for their views,” said Chris Ramsaroop of the Asian-Canadian Labour Alliance. 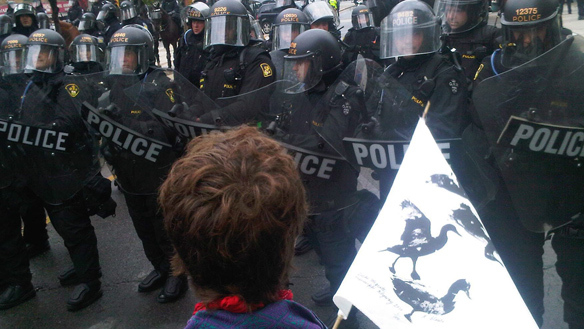 Sarah Reaburn, of Toronto Street Medics, said those on the streets who had prepared to offer first-aid and other treatment for anyone hurt during the G20 demonstrations were completely overwhelmed. She said the “irresponsible and unchecked” use of police force was unprecedented and resulted in large numbers of serious injuries, including head trauma and broken bones. “While everyone has chosen completely to focus on the 90 minutes of property destruction which occurred on Saturday [June 26], the extreme violence that occurred against people throughout the entire weekend has been overlooked and ignored,” Reaburn said. 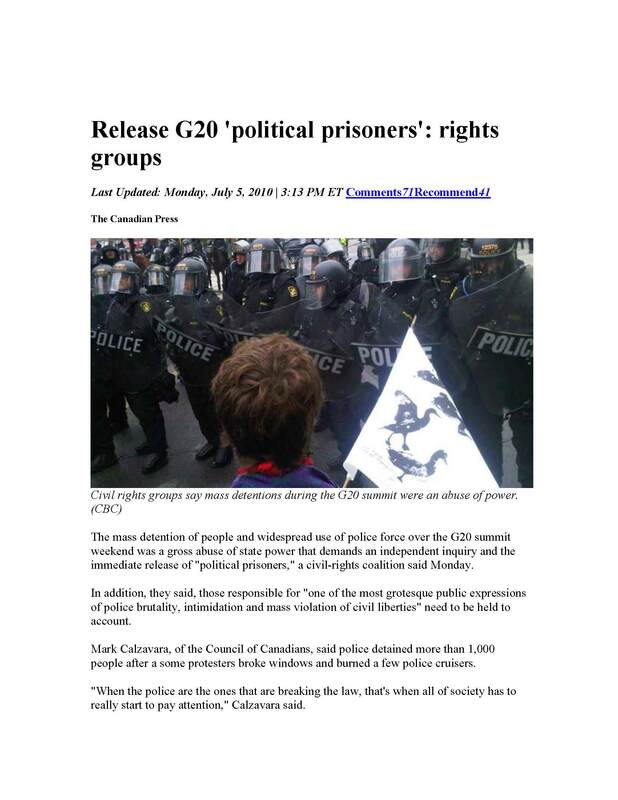 A group of York University professors also added their voices of condemnation about the “indiscriminate use of aggression” by G20 security police against peaceful protesters. Police did not immediately respond to a request for comment Monday. However, they have defended their actions as necessary in light of the vandalism that Saturday afternoon. Toronto police Chief Bill Blair has said as many as 1,000 anarchists came to “attack” the summit, but were stymied by the potent security. Police have said if anyone has a beef with how security forces behaved, there are normal complaint mechanisms they can follow. White called that position ludicrous. “You can’t pre-emptively violate rights and then ask citizens to sort it out in the future,” White said. Various individuals and groups have said they are considering a class-action lawsuit or other civil action against police, saying officers and those who gave them orders have to be held accountable. Groups such as Amnesty International and the Canadian Civil Liberties Association have also condemned police tactics and called for an independent inquiry.